This article is about the 1999 film. For other uses, see The World Is Not Enough (disambiguation). The film's plot revolves around the assassination of billionaire Sir Robert King by the terrorist Renard, and Bond's subsequent assignment to protect King's daughter Elektra, who had previously been held for ransom by Renard. During his assignment, Bond unravels a scheme to increase petroleum prices by triggering a nuclear meltdown in the waters of Istanbul. Filming locations included Spain, France, Azerbaijan, Turkey, and the UK, with interiors shot at Pinewood Studios. Despite receiving mixed reviews, with the plot and Denise Richards' casting being frequently targeted for criticism, The World Is Not Enough earned $361,832,400 worldwide. It was also the first Eon-produced Bond film to be officially released under the Metro-Goldwyn-Mayer label instead of United Artists, the original owner and distributor of the film franchise. MI6 agent James Bond arrives at a Swiss bank in Bilbao, Spain, to retrieve money for British oil tycoon Sir Robert King. Bond also wants the name of the killer of a fellow MI6 agent, but the banker is killed by his assistant before he can reveal it. Bond escapes from the banker's office with the money, but it is revealed to be booby-trapped; Sir Robert is killed by an explosion inside MI6 headquarters in London. Bond gives chase to the assassin on a Q-modified speedboat down the Thames to the Millennium Dome, where she attempts to escape by hot air balloon. Bond offers her protection, but she refuses and blows up the balloon, killing herself. Although injured falling from the balloon, Bond is cleared for duty, and traces the recovered money to Viktor "Renard" Zokas, a KGB agent-turned-terrorist. Following an earlier attempt on his life by MI6 agent 009, Renard was left with a bullet in his brain, which is gradually destroying his senses, making him immune to pain until he dies. M assigns Bond to protect King's daughter Elektra against Renard, who had previously abducted her. Bond flies to Azerbaijan, where Elektra is overseeing the construction of her family's oil pipeline. During a tour of the pipeline's proposed route through the mountains, Bond and Elektra are attacked by a hit squad in armed, paraglider-equipped snowmobiles. Despite being unarmed, Bond is able to dispatch the snowmobiles by using the terrain to his advantage. Bond visits Valentin Zukovsky at his Baku casino to acquire information about Elektra's attackers; he deduces that Elektra's head of security, Davidov, is secretly in league with Renard. Bond kills Davidov and takes his place on a plane bound for a Russian ICBM base in Kazakhstan. He poses as a Russian nuclear scientist and meets American nuclear physicist Christmas Jones, before entering the silo. Inside, Renard is removing the GPS locator card and weapons-grade plutonium from a nuclear bomb. Before Bond can kill him, Jones blows his cover. Renard drops a hint that Elektra and he are collaborating and flees with the plutonium, while Bond and Jones escape the exploding silo with the locator card. Back in Azerbaijan, Bond discloses to M that Elektra may not be as innocent as she seems, before they discover the stolen bomb from Kazakhstan is attached to an inspection rig heading towards the oil terminal. Bond and Jones enter the pipeline to deactivate the bomb, and Jones discovers that half of the plutonium is missing. They both jump clear of the rig before a large section of pipeline is destroyed, and they are presumed killed. Back at the command centre, Elektra reveals Renard and she are conspirators and that she killed her father as revenge for using her as bait for Renard. She abducts M, whom she resents for advising her father not to pay the ransom money, and imprisons her in the Maiden's Tower. Bond accosts Zukovsky at his caviar factory in the Caspian Sea for information on Elektra, having deduced Elektra's culpability himself, and is then attacked by Elektra's sawing helicopters. Zukovsky reveals his arrangement with Elektra was in exchange for the use of a submarine, currently being captained by Zukovsky's nephew, Nikolai. The group goes to Istanbul, where Jones realises that if Renard were to insert the stolen plutonium into the submarine's nuclear reactor, the resulting nuclear explosion would destroy Istanbul, sabotaging the Russians' oil pipeline in the Bosphorus and leaving Elektra's uncontested. Bond then receives a signal from the locator card M has activated using a clock battery, just before Zukovsky's underling, Bullion blows up the command centre. Bond and Jones are captured by Elektra's henchmen. Jones is taken aboard the submarine. Bond is taken to the tower, where Elektra tortures him with a garrote. Zukovsky and his men arrive and seize the tower, but Zukovsky is shot by Elektra; though dying, he frees Bond with his cane gun. Bond frees M and kills Elektra, before diving after the submarine. Bond boards the submarine and frees Jones. Following a firefight with the crew, the submarine hits the bottom of the Bosphorus, causing its hull to rupture. Bond catches up with Renard and kills him in the submarine's reactor room by impaling him with the plutonium rod. Bond and Jones escape from the submarine via the torpedo launcher, leaving the flooded reactor to detonate safely underwater. As MI6 try to locate Bond by satellite surveillance, Jones and he celebrate in Turkey. Sophie Marceau as Elektra King, an oil heiress who is seemingly being targeted by Renard, the world's most wanted terrorist, Bond is tasked by M to protect her at all costs, although he suspects that there is more to her than meets the eye. Robert Carlyle as Victor "Renard" Zokas, a former KGB agent turned high-tech terrorist. Years ago, Renard kidnapped Elektra King in exchange for a massive ransom demand. The ordeal resulted in a failed assassination attempt by MI6 and left Renard with a bullet lodged in his brain which renders him impervious to pain as well as slowly killing off his other senses. Renard now seeks revenge on both the King family and MI6 for his death sentence, as the bullet will kill him when the bullet reaches the center of his brain. Denise Richards as Dr. Christmas Jones, an American nuclear physicist assisting Bond in his mission. Richards stated that she liked the role because it was "brainy", "athletic", and had "depth of character, in contrast to Bond girls from previous decades". Richards stated that a lot of viewers "made fun of" the character's attire but that "These Bond girls are so outrageous and if I did really look like a scientist, the Bond fans would have been disappointed." Writer Ben Bussey stated in a Yahoo! Movies article that "it's clear that Eon were never aiming especially high with this character" since the company "reportedly" auditioned Geri Halliwell and Tiffani Thiessen for the role. Robbie Coltrane as Valentin Zukovsky: A former Russian mafia boss and Baku casino owner. Bond initially seeks out Zukovsky for intel on Renard and is subsequently aided by him when Zukovsky's nephew falls into Renard's captivity. Coltrane reprises his role from GoldenEye. Colin Salmon as Charles Robinson: M's Deputy Chief of Staff. Desmond Llewelyn as Q: MI6's "quartermaster" who supplies Bond with multi-purpose vehicles and gadgets useful for the latter's mission. The film would be Llewelyn's final performance as Q. Although the actor was not officially retiring from the role, the Q character was training his eventual replacement in this film. Llewelyn was killed in a car accident shortly after the film's premiere. John Cleese as R: Q's assistant and successor. The character is never formally introduced as "R" – This was simply an observation on Bond's part: "If you're Q....does that make him R?" Samantha Bond as Miss Moneypenny: M's secretary. Serena Scott Thomas as Dr. Molly Warmflash, an MI6 agent and doctor assigned to examine Bond, as well as describing Renard's seeming invincibility due to the terminal bullet in his brain that will kill him when it reaches the center of his brain. John Seru as Gabor: Elektra King's bodyguard who is seen accompanying King wherever she travels. Ulrich Thomsen as Sasha Davidov: Elektra King's head of security in Azerbaijan and Renard's secret liaison. Goldie as Bull: Valentin Zukovsky's gold-toothed and gold-haired bodyguard. Although listed as 'Bull' in the credits, Zukovsky refers to him as 'Bullion' in the film. Maria Grazia Cucinotta as Giulietta da Vinci, credited in the film as "Cigar Girl": An experienced assassin working for Renard, who appears as a lady who supplies Bond and the banker with cigars during their meeting. Her name is revealed in the novelisation. David Calder as Sir Robert King: Elektra's father and an oil tycoon who is later killed during a bomb attack on MI6 headquarters. Coltrane and Carlyle previously appeared together in Cracker, but they do not share any screen time in this film. In November 1997, a month prior to the release of Tomorrow Never Dies, Barbara Broccoli watched a news report on Nightline detailing how the world's major oil companies were vying for control of the untapped oil reserves in the Caspian Sea in the wake of the Soviet Union's collapse, and suggested that controlling the only pipeline from the Caspian to the West would be an appropriate motivation for a potential Bond villain. She and Michael G. Wilson hired screenwriters Neal Purvis and Robert Wade to work on the film following their work on Plunkett & Macleane; Purvis and Wade would eventually write or co-write all of the proceeding Bond films up to Spectre. Broccoli was especially impressed by the writers' suggestion of a female villain, stating that "With Elektra, Bond thinks he has found Tracy, but he's really found Blofeld". Joe Dante, and later Peter Jackson, were initially offered the opportunity to direct the film. Barbara Broccoli enjoyed Jackson's Heavenly Creatures, and a screening of The Frighteners was arranged for her. She disliked the latter film, however, and showed no further interest in Jackson. Jackson, a lifelong Bond fan, remarked that as Eon tended to go for less famous directors, he would likely not get another chance to direct a Bond film after The Lord of the Rings. Hoping to find a director capable of eliciting strong performances from women, the producers eventually hired Michael Apted, as his work with Sissy Spacek in Coal Miner's Daughter, Sigourney Weaver in Gorillas in the Mist and Jodie Foster in Nell has earned all three actresses Oscar nominations (with Spacek winning). Apted's then-wife Dana Stevens did an uncredited rewrite, primarily to strengthen the female characters' roles, before Bruce Feirstein, who had worked in the previous two films, was hired to work on Bond's role. Initially the film was to be released in 2000, rumoured to be titled Bond 2000. Other rumoured titles included Death Waits for No Man, Fire and Ice, Pressure Point and Dangerously Yours. The title The World Is Not Enough is an English translation of the Latin phrase Orbis non sufficit, which in real life was the motto of Sir Thomas Bond. In the novel On Her Majesty's Secret Service and its film adaptation, this is revealed to be the Bond family motto. The phrase originates from the epitaph of Alexander the Great. The pre-title sequence begins in Bilbao, Spain, featuring the Guggenheim Museum. After the opening scene, the film moves to London, showcasing the SIS Building and the Millennium Dome on the Thames. Following the title sequence, Eilean Donan castle in Scotland is used by MI6 as a location headquarters. Other locations include Baku, Azerbaijan, the Azerbaijan Oil Rocks and Istanbul, Turkey, where Maiden's Tower and Küçüksu Palace are shown. The sequence lasts for about 14 minutes, the longest pre-title sequence in the Bond series to date. Originally, the pre-credits sequence was to have ended with Bond's leap from the window and descent to the ground, finishing as Bond rushes away from the area as police cars approach. Then, after the credits the sequence in MI6 headquarters would have been next, with the boat scenes the next major action sequence. However, the pre-credits scenes were viewed as lacklustre when compared to ones from previous 007 films, so the credits were pushed back to appear after the boat sequence. The Daily Telegraph claimed that the British Government prevented some filming in front of the actual MI6 Headquarters at Vauxhall Cross, citing a security risk. However, a Foreign Office spokesperson rejected the claims and expressed displeasure with the article. Principal photography began on January 17, 1999, and lasted until June of that year. The studio work for the film was shot as usual in Pinewood Studios, including Albert R. Broccoli's 007 Stage. Bilbao, Spain was used briefly for the exterior of the Swiss bank and flyover-bridge adjacent to the Guggenheim Museum. In London outdoor footage was shot of the SIS Building and Vauxhall Cross with several weeks filming the boat chase on the River Thames eastwards towards the Millennium Dome, Greenwich. The canal footage of the chase where Bond soaks the parking wardens was filmed at Wapping and the boat stunts in Millwall Dock and under Glengall Bridge were filmed at the Isle of Dogs. Chatham Dockyard was also used for part of the boat chase. Stowe School, Buckinghamshire, was used as the site of the King family estate on the banks of Loch Lomond. Filming continued in Scotland at Eilean Donan Castle which was used to depict the exterior of MI6 temporary operations centre "Castle Thane". The skiing chase sequence in the Caucasus was shot on the slopes of Chamonix, France. Filming of the scene was delayed by an avalanche; the crew helped in the rescue operation. The interior (and single exterior shot) of L'Or Noir casino in Baku, Azerbaijan, was shot at Halton House, the officers' mess of RAF Halton. RAF Northolt was used to depict the airfield runway in Azerbaijan. Zukovsky's quayside caviar factory was shot entirely at the outdoor water tank at Pinewood. The exterior of Kazakhstan nuclear facility was shot at the Bardenas Reales, in Navarre, Spain, and the exterior of the oil refinery control centre at the Motorola building in Groundwell, Swindon. The exterior of the oil pipeline was filmed in Cwm Dyli, Snowdonia, Wales, while the production teams shot the oil pipeline explosion on Hankley Common, Elstead, Surrey. Istanbul, Turkey, was used in the film, and Elektra King's Baku villa was actually in the city, also using the famous Maiden's Tower which was used as Renard's hideout in Turkey. The underwater submarine scenes were filmed in the Bahamas. The BMW Z8 driven by Bond in the film was the final part of a three-film product placement deal with BMW (which began with the Z3 in GoldenEye and continued with the 750iL in Tomorrow Never Dies) but, due to filming preceding release of the Z8 by a few months, several working mock-ups and models were manufactured for filming purposes. The soundtrack to The World Is Not Enough is the second Bond soundtrack to be composed by David Arnold. Arnold broke tradition by not ending the film with a reprise of the opening theme or, as with the previous three films, a new song. Originally, Arnold intended to use the song "Only Myself to Blame" at the end of the film; however, Apted discarded this and the song was replaced by a remix of the "James Bond Theme". "Only Myself to Blame", written by Arnold and Don Black and sung by Scott Walker, is the 19th and final track on the album and its melody is Elektra King's theme. The theme is heard in "Casino", "Elektra's Theme" and "I Never Miss". Arnold added two new themes to the final score, both of which are reused in the following film, Die Another Day. The title song, "The World Is Not Enough", was written by David Arnold with Don Black and performed by Garbage. It is the fifth Bond theme co-written by Black, preceded by "Thunderball", "Diamonds Are Forever", "The Man with the Golden Gun", and "Tomorrow Never Dies". IGN chose "The World Is Not Enough" as the ninth-best James Bond theme of all time. In 2012 Grantland ranked the song as the second-best Bond song of all-time, behind only "Goldfinger." The song also appeared in two "best of 1999" polls: #87 in 89X's "Top 89 Songs of 1999" and No. 100 in Q101's "Top 101 of 1999". The World Is Not Enough premiered on 19 November 1999 in the United States and on 26 November 1999 in the United Kingdom. Its world premiere was 8 November 1999 at the Fox Bruin Theater, Los Angeles, USA. At that time MGM signed a marketing partnership with MTV, primarily for American youths, who were assumed to have considered Bond as "an old-fashioned secret service agent". As a result, MTV broadcast more than 100 hours of Bond-related programmes immediately after the film was released, most being presented by Denise Richards. The film opened at the top of the North American box office with $35.5 million. Its final worldwide gross was $361 million worldwide, with $126 million in the United States alone. It became the highest grossing James Bond film of all time until the release of Die Another Day. The film was also selected for the first round of nominations for the Academy Award for Best Visual Effects but failed. The film was nominated for a Best Action/Adventure/Thriller Film Saturn Award, Pierce Brosnan won both the Empire Award and the Blockbuster Entertainment Award as Best Actor, and David Arnold won a BMI Film Music Award for his score. The film became the first in the Bond series to win a Golden Raspberry when Denise Richards was chosen as "Worst Supporting Actress" at the 1999 Razzie Awards. Richards and Brosnan were also nominated for "Worst Screen Couple". The initial release of the DVD includes the featurette "Secrets of 007", which cuts into "making of" material during the film; the documentary "The Making of The World Is Not Enough"; two commentary tracks—one by director Michael Apted, and the other by production designer Peter Lamont, second unit director Vic Armstrong, and composer David Arnold; a trailer for the PlayStation video game, and the Garbage music video. The Ultimate Edition released in 2006 had as additional extras a 2000 documentary named "Bond Cocktail", a featurette on shooting the Q Boat scenes, Pierce Brosnan in a press conference in Hong Kong, deleted scenes, and a tribute to Desmond Llewelyn. Reception was mixed. Chicago Sun-Times critic Roger Ebert said the film was a "splendid comic thriller, exciting and graceful, endlessly inventive", and gave it three-and-a-half stars out of four. On the other hand, Eleanor Ringel Gillespie of The Atlanta Journal-Constitution disliked the film, calling it "dated and confused". 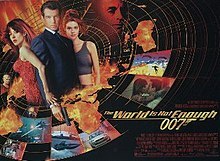 Rotten Tomatoes gave The World Is Not Enough a 51% rating, the lowest of the Brosnan films, and Metacritic gave the film a score of 59 out of 100. Nathan Rabin from The A.V. Club opined that "enough fun moments are scattered throughout to make it a decent Bond entry. But the series still needs a massive shot of fresh ideas if it wishes to become anything more than a nostalgia-fueled commercial sure thing". Antonia Quirke from The Independent said that the film "is certainly less definitively feeble than other recent Bond offerings, with an at least two-dimensional female character in the bold and oval Marceau. But my reaction is much the same as to a new Rolling Stones album: I'm just grateful that it's not embarrassing". Negative criticism was focused on the execution of the plot, and the action scenes were considered excessive. Pete Debruge of Variety wrote that "[The World Is Not Enough] presents a conflicted persona torn between the corny antics of the Roger Moore era and the grim seriousness of where things would eventually go under Daniel Craig’s tenure. It also contains a dose of Timothy Dalton-esque toughness [...] Much of what made Brosnan such a great Bond is thrust into the backseat by lame jokes and a premature attempt to mix up the formula", concluding that it was "nothing but a reversion to the franchise’s most adolescent tendencies". Entertainment Weekly picked it as the worst Bond film of all time, saying it had a plot "so convoluted even Pierce Brosnan has admitted to being mystified". Norman Wilner of MSN chose it as the third worst film, above A View to a Kill and Licence to Kill, while IGN chose it as the fifth worst. Richards was also widely criticized for not being credible in the role of a nuclear scientist, with Variety calling her "the least plausible nuclear physicist in the history of movies, who makes even the electrochemist Elisabeth Shue played in 1997’s The Saint sound like a Nobel laureate"; Nathan Rabin panned her performance and called it "so laughably awful that the film comes to a dead stop whenever she's on screen". She was ranked as one of the worst Bond girls of all time by Entertainment Weekly in 2008. Bond novelist Raymond Benson wrote his adaptation of The World Is Not Enough from the film's screenplay. It was Benson's fourth Bond novel and followed the story closely, but with some details changed. For instance, Elektra sings quietly before her death and Bond still carries his Walther PPK instead of the newer P99. The novel also gave the cigar girl/assassin the name Giulietta da Vinci and retained a scene between her and Renard that was cut from the film. In 2000, the film was adapted by Electronic Arts to create two first-person shooters of the same name for the Nintendo 64 and PlayStation. The Nintendo 64 version was developed by Eurocom and the PlayStation version was developed by Black Ops. Versions of The World Is Not Enough for the PC and the PlayStation 2 were planned for release in 2000, but both were cancelled. These versions would have used the id Tech 3 game engine from Quake III Arena. Although this game marks Pierce Brosnan's fifth appearance in a Bond video game, the game includes only his likeness; the character is voiced by Adam Blackwood. Simpson, Paul (7 November 2002). The Rough Guide to James Bond. London: Rough Guides. ISBN 1-84353-142-9. ^ "The World Is Not Enough (1999)". BFI. Retrieved 27 January 2019. ^ Parker, Barry R. (2005). Death Rays, Jet Packs, Stunts & Supercars: The Fantastic Physics of Film's Most Celebrated Secret Agent. Baltimore: Johns Hopkins University Press. ISBN 978-0-8018-8248-7. ^ Thomas, Rebecca (19 November 1999). "One girl is not enough". BBC News. Retrieved 23 December 2007. ^ Freydkin, Donna (6 November 2012). "Denise Richards: Bond showed me the 'World'". USA Today. Retrieved 16 May 2017. ^ Bussey, Ben (15 December 2013). "Dr Christmas Jones: biggest turkey of the Bond girls?". Yahoo! Movies UK. Archived from the original on 7 January 2014. Retrieved 16 May 2017. ^ a b c Cork, John; Stutz, Collin (2007). James Bond Encyclopedia. London: Dorling Kindersley. pp. 306–7. ISBN 978-1-4053-3427-3. ^ Brian Sibley (2006). Peter Jackson: A Film-maker's Journey. London: Harpercollins. pp. 397–8. ISBN 0-00-717558-2. ^ Dye, Kerry Douglas (15 November 1999). "His Word is Bond: An Interview With 007 Screenwriter Bruce Feirstein". LeisureSuit.net. Archived from the original on 5 December 2006. Retrieved 5 January 2007. ^ "TWINE & The Rumoured Titles". 26 June 2001. Archived from the original on 17 January 2008. Retrieved 1 October 2007. ^ EulogySpeech.net. "Famous Epitaphs - Unusual Epitaphs and Tombstones - Famous Eulogies - Great Eulogies - Free Eulogy Samples". www.eulogyspeech.net. Retrieved 25 March 2018. ^ a b c "Filming locations for The World Is Not Enough (1999)". Internet Movie Database. Retrieved 16 January 2008. ^ "Bond is backed... by the government". The Guardian. 27 April 1999. Retrieved 29 December 2007. ^ "British Waterways' Film Map: Canals and rivers on screen". Waterscape.com. Retrieved 15 January 2008. ^ Kent Film Office. "Kent Film Office The World Is Not Enough Film Focus". ^ Ian Nathan (October 2008). "Unseen Bond". Empire. p. 105. ^ "Motorola building". SwindonWeb. Retrieved 7 December 2009. ^ "Hollywood Films & TV Locations - Visit Wales". www.visitwales.com. Retrieved 25 March 2018. ^ ""The World Is Not Enough" OST review". AllMusic. Retrieved 16 January 2008. ^ a b "David Arnold official website". Archived from the original on 29 December 2007. Retrieved 16 January 2008. ^ Spence D. (17 November 2006). "Top 10 James Bond Theme Songs". IGN. Retrieved 4 November 2007. ^ "89X's "Top 89 Songs of 1999". Rocklists.com. Retrieved 2 March 2007. ^ "Q101's "Top 101 of 1999". Rocklists.com. Retrieved 2 March 2007. ^ "Bond 19: More than enough". BBC News. 19 November 1999. Retrieved 1 October 2007. ^ "Selling a super spy". BBC News. 19 November 1999. Retrieved 1 October 2007. ^ "The World Is Not Enough". Box Office Mojo. Retrieved 29 September 2007. ^ "James Bond movies". Box Office Mojo. Retrieved 29 September 2007. ^ "TWINE Could Be Up for an Oscar". Commanderbond.net. 4 January 2000. Archived from the original on 19 March 2008. Retrieved 1 October 2007. ^ "Awards for The World Is Not Enough". Internet Movie Database. Retrieved 25 December 2007. ^ "The World Is Not Enough DVD review". TimeForDVD.com. Retrieved 16 January 2008. ^ "The World Is Not Enough DVD & Soundtrack". UGO. Archived from the original on 21 November 2007. Retrieved 16 January 2008. ^ Ebert, Roger. "The World is Not Enough". Chicago Sun-Times. Retrieved 17 December 2007. ^ Gillespie, Eleanor Ringel. "The World Is Not Enough". The Atlanta Journal-Constitution. Archived from the original on 12 February 2006. Retrieved 16 January 2008. ^ "The World Is Not Enough". Rotten Tomatoes. Retrieved 29 September 2007. ^ "The World Is Not Enough". Metacritic. Retrieved 26 December 2007. ^ a b Rabin, Nathan (19 January 2000). "The World is Not Enough DVD Review". The A.V. Club. Retrieved 31 January 2019. ^ Quirke, Antonia (28 November 1999). "Film: Review - Why Pierce is not enough". The Independent. Retrieved 31 January 2019. ^ Matt Venendaal (16 May 2006). "The World Is Not Enough (DVD) review". IGN. Retrieved 25 December 2007. ^ a b Debruge, Pete (19 October 2012). "Revisiting 1999's 'The World Is Not Enough'". Variety. Penske Media Corporation. Retrieved 31 January 2019. ^ Benjamin Svetkey, Joshua Rich (15 November 2006). "Countdown: Ranking the Bond Films". Entertainment Weekly. Retrieved 5 February 2008. ^ Norman Wilner. "Rating the Spy Game". MSN. Archived from the original on 19 January 2008. Retrieved 25 December 2007. ^ "James Bond's Top 20". IGN. 17 November 2006. Retrieved 25 December 2007. ^ Lisanti, Tom; Paul, Louis (2002). "Film Fatales: Women in Espionage Films and Television, 1962–1973". Jefferson, NC: McFarland & Co. ISBN 978-0-7864-1194-8. ^ Howe, Desson, 19 November 1999, 'World': Bond without end, Washington Post. ^ Rich, Joshua (8 January 2008). "James Bond Babes: Best and Worst". Entertainment Weekly. Retrieved 5 February 2008. ^ Black Ops had previously adapted Tomorrow Never Dies for the PlayStation and would go on to develop Nightfire in 2002. ^ "The World Is Not Enough preview (PS2)". IGN. Retrieved 17 December 2007. ^ "Adam Blackwood". IMDb. Retrieved 25 March 2018. Wikimedia Commons has media related to The World Is Not Enough (film).